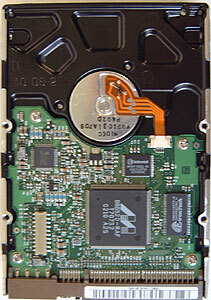 Abstract: Today we're looking at their 80 GB 7200 RPM Ultra/100 SP8004H hard drive which retails for $180 CDN. Like most things, Samsung knows that diversity is the spice of life. From monitors LCD or CRT, to memory and even hard drives, if it has something to do with computers Samsung is usually close behind. 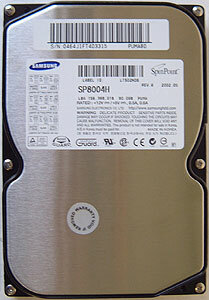 Today we're looking at their 80 GB 7200 RPM Ultra/100 SP8004H hard drive which retails for $180 CDN. Samsung like most other hard drive manufacturers has not jumped on the Ultra/133 bandwagon rather they're going to be focusing on the new upcoming Serial ATA that's why their SP8004H is not Ultra/133 compliant. Still it does boast quite an array of impressive specs, the hard drive spins at 7200 RPM, uses two platters with an areal density of 40GB and has 2MB of cache. We found it quite humorous that a Samsung hard drive would use memory made by EtronTech instead of their own. We tested the hard drive with the Epox 8K3A+ which uses the VIA 8233A southbridge that has native support for Ultra/133, however since our drive is only Ultra/100 compatible everything is running in Ultra/100 mode (DMA mode 5).